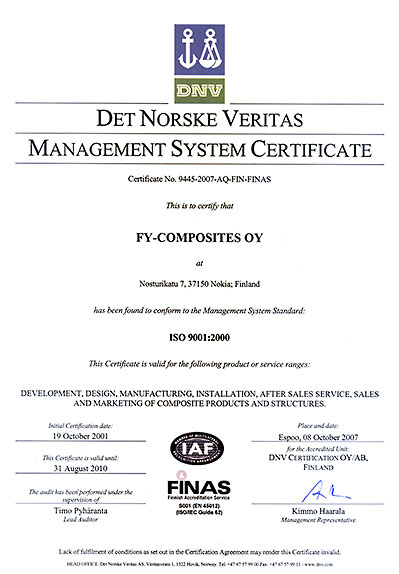 FY-Composites Oy is a leading company in the development and manufacturing of composite products for ballistic protection and structural applications. Since 1986 it has served exacting customers in numerous challenging projects. FY-Composites' highly-successful solutions and structures have been designed and developed together with the customers. Its novel and high-class manufacturing methods have resulted in top-quality products that meet strict customer requirements. serve the customers in their respective areas. Each of the business areas has strong expertise in its own area as well as a thorough knowledge of advanced composite materials technology. Ballistic Protection is focused on lightweight solutions in the protection of personnel and vehicles. The product range includes helmets, visors, armoured panels and shields. Structural Composites is serving customers as a system supplier of components and structures for demanding applications in mechanical engineering, shipbuilding, transportation, etc. After Sales Service provides solutions when there is a need for complex repairs to damaged composite structures. This business area also includes spare parts delivery and training. These services are also available for all customers who require reliable and high quality maintenance and repair for their composite products. FY-Composites Oy has a wealth of experience in the development, design, manufacturing and maintenance of a wide range of ballistic protection products. FY-Composites has a long history of manufacturing ballistic helmets. Our helmets are designed to give their users the best possible protection against fragments and bullets in diverse situations. Their extensive protection area, high energy absorption capacity, extreme strength and minimal deformation, i.e. trauma after a hit, all contribute to form a unique combination of safety factors. FY-Composites' visor retaining system is suitable for facial protection in a wide variety of situations, including de-mining, explosives handling and disposal, and police operations. The system fits several common helmet models and no tools are needed for mounting. The visor can be locked in three different positions. FY-Composites Oy has developed and is supplying ballistic shields for military, police and other authority users. Shields are designed for different kinds of purposes and protection levels so that the user can choose an appropriate product for each operation. Compared to other commercially available shields, special effort is put into the design of the shield handle. Its ergonomic construction makes it comfortable and offers safety to the shield user. The Rapid Armor Shelter System® (international patent pending) is a new, innovative modular ballistic protection system. This military certified lightweight fortification wall system is ideal for fast moving troops. Fortification walls can be built and dismantled in a few minutes allowing troops to be protected even during short stops or operations. Panels protect men or property mainly from fragments, with a protection level of v50 > 600 m/s (1.1 g FSP, STANAG 2920). For bullet protection a multipanel system with a sand filling can be used. The Rapid Armor Shelter System® is simple and easy to use. Two basic shapes, squares (side length 950 mm, weight approx. 18 kg/each) and triangles (side length 950 mm, weight approx. 8 kg/each), are equipped with innovative quick coupling devices and supporting legs enable the construction of a large number of various fortification combinations in a very short time. FY-Composites Oy is the turnkey supplier for lightweight armouring solutions, which are manufactured in accordance with the customer's specific needs. Composite armouring solutions are typically used in applications where it is necessary to reduce armouring weight to maximise operational mobility and payload. FY-Composites Oy's has many years and numerous projects-worth of experience in the design and manufacture of armouring solutions that protect against fragments and secondary projectiles (spall liners), hand guns (9 mm Luger, 357 Magnum, 44 Magnum), shotguns, high-powered rifles, armour-piercing rifles (steel core - hard metal core) and heavy machine guns. Armouring design and selection is always a optimisation study between performance (protection level), weight and price. 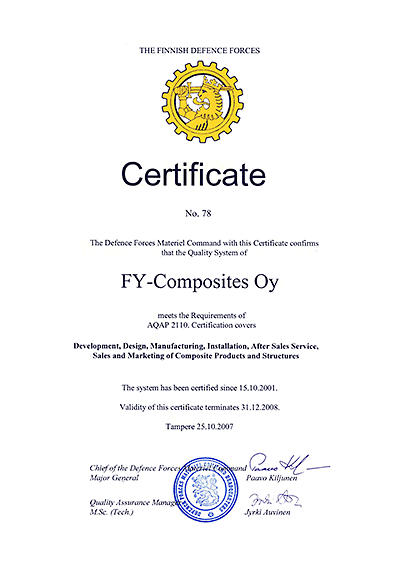 FY-Composites Oy is able to use and combine armouring metals and ceramics in its armour composite materials. Armouring steel with composite backing is an inexpensive solution if weight is not a critical requirement. Alumina and boron carbide ceramic as a face material with a backing made of aramid (Kevlar™ or Twaron™), polyethylene, polypropylene or glass fibre with a specific matrix material can be used in high performance and lightest weight requirement solutions. PTV Armadillo 4x4 is a low cost armoured transport vehicle offering a high level of protection against bullet, fragment, blast and mine threats, excellent off-road capability, attractive weight-payload-ratio. The vehicle being designed as transport vehicle avoids martial design elements. The PTV Armadillo 4x4 is available in different configurations such like ambulance, tactical and logistical vehicle. The platform is available with spall-liners on the bottom and the platform gates to protect the payload. The ambulance cabin that also can be used as workshop or command post will be protected if needed, due to the large surfaces at the price of a significant weight increase but within the limits. Taking a used vehicle saves a lot of money. As MRO-experts we are used to perform overhaul on vehicles and make sure that the vehicle receives “another life”. After having performed the overhaul services the vehicle can be used another 10plus years. Due to the number of Unimog vehicles sold worldwide there will be no obsolescence issue for many years. Using “old fashioned” non electronic Diesel engines is another advantage: The engine remains very reliable and can be maintained in the field with simple tools by almost any mechanic. The protection is achieved by a combination of low cost armoured steel and low weight fibre- /ceramics composite material, developed by Finnish FY-Composites Oy, our experienced project partner. The respective material is used where it offers the maximum benefit in regard to performance, weight and cost. Some minor modifications are made to chassis to improve effectively mine resistance, vehicle stability and driving comfort with armouring. Last but not least the concentration on basic and passive protection leads to low cost, too. The air condition does not offer NBC-protection, there is no turret and no other cost-driving equipment installed. PTV Armadillo 4x4 – no frills, just the basic protection to save the life and health of the persons on board. PVT Armadillo vehicle has been developed in collaboration with German company MWB Fahrzeugtechnik GmbH. MWB Fahrzeugtechnik is performing technical services for German Army for more than 30 years. Expertise in maintaining military vehicles combined with exhaustive experience in outfitting VIP vehicles with armour has been the key success factor to design and build the low cost PTV Armadillo 4x4 – Protected Transport Vehicle Armoured and Improved Light Lorry 4x4. Accurate modelling and design capabilities are important in many performance and weight critical structures. Various different properties such as mechanical, thermo-mechanical, vibration, shock and ballistic behaviour can be modelled. 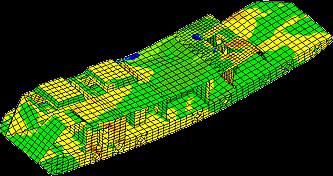 FY-Composites is using extremely powerful modelling and analysis tools such as 3D-modelling, non-linear finite element analysis and advanced composite analysis software. Production efficiencies and quality meet and exceed those typically found in the modern composite industry. Materials and material technology are developing with ever-increasing speed, and their applicability in customer projects requires continuous and active R&D efforts. Simultaneously, manufacturing technologies are improving along with the materials and there is also pressure to increase the productivity with better quality solutions. To offer competitive solutions to our customers, FY-Composites is actively investing in R&D, maintaining the leading edge of technology for the benefit of the customer. The active implementation of various R&D projects together with our national and international scientific network ensures the high level of our technology.